I recently came across the attached photo of my father in law who was a student at Varndean Grammar School in the 1930s. I believe the photo was taken in about 1937 or 1938. Jack Manning, (my father in law) is in the second row down on the right. Jack went to school with Sir Paul Scofield, whose ‘Time‘ obituary states ”At Varndean School for Boys, in Brighton, he played Juliet and Rosalind, but showed no interest in further education and left in his mid-teens”. It is possible therefore that he is also present in the photo, though I have no idea where. 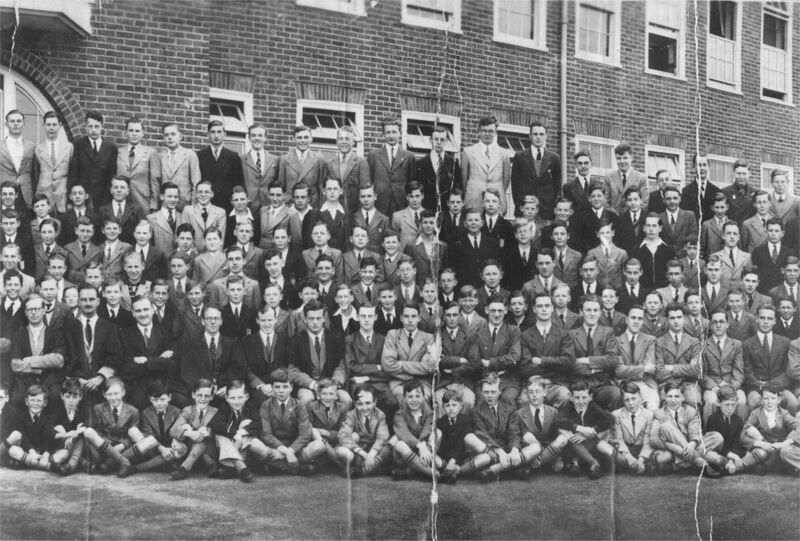 As most of the boys in the photo would be in their 80s by now, identification of individuals might be difficult. But if you do recognise yourself or anyone else, please leave a comment below. I have recently scanned a lot of my dad’s pictures, he was at Varndean in the mid to late 1930s. In a couple of them he identifies ‘Scofield’ as one of the boys, along with others of his friends, unfortunately he hasn’t put the christian names. Could this be the same Scofield? There is every possibility that my father knew your father in law, though I can’t see him in this school picture. I think Paul Schofield is ninth from the left in the fourth row from the top. He is wearing a light coloured jacket and a dark tie. I have a full copy of this photo if anyone is interested. It’s one of those long full school ones. My husband’s uncle Colin Curtis is in it somewhere but I haven’t been able to identify him. He was born in 1926 so would have been one of the younger ones. I too have a full panoramic school photo with my own father as a 16 year old student in 1936. He has only just died aged 96 and I have school reports, first reference and a school cap (!) which has survived the years and several moves! My father Thomas Budgen was born in 1925, he went to Varndean school, I would love to see the full photo if that’s possible. My uncle and my namesake, David Lawrence, is ninth from the left in the back row. I believe he became Head Boy before leaving Varndean to become a local architect. My father Edwin Frank Candlin left Varndean College in 1930. Would he have attended this school?